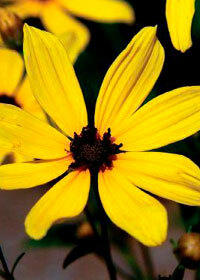 This improvement on the native species sets hundreds of 2 1/2- to 3-inch daisies of bright yellow-gold. They appear in gigantic bouquets atop straight stems and tall, dense foliage, beginning in late summer and continuing through early fall. Finches love the seeds in winter!